‘Blogger’s Note: This is a delayed post so some of the information is incomplete. Florida’s 2 big races were hi-jacked, Scott bought the Florida Senate seat, but the Arizona pick-up by Sinema was sweet. Mr. Gillum of Fla. is an up and coming force. The Daily Kos Elections Morning Digest is compiled by David Nir, Jeff Singer, Stephen Wolf, and Carolyn Fiddler, with additional contributions from David Jarman, Steve Singiser, Daniel Donner, James Lambert, David Beard, and Arjun Jaikumar. 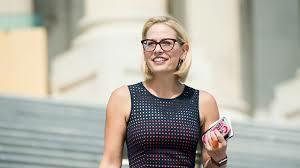 • AZ-Sen, AZ-SoS: On Monday night, following a ballot drop that increased her margin to over 38,000 votes, the AP declared Rep. Kyrsten Sinema the winner of Arizona’s hard-fought Senate race, making her the first Democrat to win a Senate seat in the Grand Canyon State in 30 years. Though Sinema trailed Republican Rep. Martha McSally on election night, ballots counted after Election Day consistently favored her, allowing her to leg out to a margin of 49.7 to 48.0 at the time the race was called. This seat became open when Republican Sen. Jeff Flake decided to retire after a single term, recognizing that he could no longer win a GOP primary after being on the receiving end of heaps of abuse from Donald Trump. What passes for the Republican establishment these days then rallied around McSally, who beat two ultra-extreme opponents, former state Sen. Kelli Ward and the disgraced ex-sheriff of Maricopa County, Joe Arpaio, to capture the GOP nomination. Sinema, meanwhile, won the Democratic primary with little opposition, despite her transformation from a one-time Green Party member to a member of the conservative Blue Dog Coalition. Both parties spent heavily, and the race was a tossup the whole way through—a remarkable enough development on its own, given Democrats’ long drought in Arizona. (Until Monday, they hadn’t won a statewide race of any kind here in a decade.) But this very diverse state reacted poorly to Trump, holding him to a 48-45 win that was the poorest showing for a Republican presidential candidate since 1996. That marked the latest step in a gradual transformation that saw Democrats put together their strongest election night in Arizona in a very long time. In addition to powering Sinema to a win, this latest ballot update also moved Democrat Katie Hobbs into a 5,667-vote lead over Republican Steve Gaynor in the race for secretary of state, and she’s likely to keep it. This post is doubly important because, in addition to serving as the state’s top election administrator, the secretary of state is also next in line for the governorship. (Arizona has no lieutenant governor.) Four of the state’s last nine governors have, in fact, been elevated from this position. On top of that, shortly after their Sinema call, the AP announced Democrat Kathy Hoffman as the winner of the race for superintendent of public instruction, a position Democrats last held in the mid-1990s. Sandra Kennedy is also poised to win a seat on the corporation commission, which regulates utilities, making her the only Democrat on the five-member board. On the legislative level, Democrats picked up four seats in the state House, slicing the Republican majority to a narrow 31-29 margin. And while Democrats did not make gains in the Senate (which Republicans held 17-13 heading into the election), one GOP-held seat remains uncalled, and there are still some 172,000 ballots left to count statewide. Both chambers will assuredly be top targets for Democrats in 2020. • FL-Sen, FL-Gov: As expected, recounts in three super-tight Florida races—for senator, governor, and agriculture commissioner—were ordered on Saturday, since all three were separated by a margin of less than 0.5 percent. All 67 counties are busy conducting a machine recount of all ballots, meaning ballots are fed back through scanners, with a deadline of 3 PM ET on Thursday. After the machine recounts, if any races are within a margin of 0.25 percent, a second manual recount will take place of all undervotes and overvotes to determine voter intent. An undervote means a voter failed to vote in a particular race, while an overvote means a voter chose too many options in a given race—or at least, a machine thinks so. A human can be more discerning. The massive number of votes and the short timeframe are putting a strain on some counties, some of which are now working 24 hours a day. Susan Bucher, the top elections official in heavily Democratic Palm Beach County, where over half a million ballots were cast, said on Sunday that it would be “impossible” to finish on time, though she later expressed confidence her county would meet the deadline. Of course, the biggest question is whether any of these recounts could flip the outcome in any of these races. Marc Elias, a top Democratic election lawyer who is working for Nelson, sounds cautiously optimistic, saying he ultimately expects his client “to take a small lead.” In particular, Elias thinks that the well-documented undervote problem in Broward County, where some 25,000 voters apparently skipped the Senate race, was due to improper scanner calibration rather than poor ballot design—though the ballot does seem to have been poorly laid out. But Elias’ track record is good: He prophesied on Thursday that Kyrsten Sinema would win the Senate race in Arizona, a forecast that turned out to be quite keen. This entry was posted in Politics by fshiels. Bookmark the permalink.